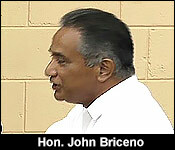 Opposition Leader John Briceno discussed the crushing price of diesel fuel. It remains at over ten dollars - and at the height of the tourist season and the start of the cane crop - it's a hold-back on economic activity. He said the taxes on fuel are too high. "Today our farmers and the people in the productive sector have to struggle with the cost of diesel at $10.75 per gallon. This administration got elected to office on the promise to bring down the cost of living no matter what. Guess what? When they came into office in 2008, the cost of diesel at the pump was $8.10. Today it is $2.65 more than it was than when they were just elected back in 2008. In 2008, oil was at US $100 a barrel and diesel was sold for $8.10. Today, $oil is at US $51 per barrel and diesel is being sold at $10.75 per gallon and in Punta Gorda it is at $11 per gallon. The oil is US $49 a barrel cheaper today, madam speaker, and yet we are paying $2.65 more. It doesn't make sense right? This UDP government has collected $69,300,000 in taxes on diesel alone. Diesel is the engine of the productive sector. As one friend mentioned to me, 'This is the Barrownomics at its best,' collecting $69 million dollars of tax on the productive sector that needs all the help to be able to survive in today's competitive world. The very people who are working very hard, trying not to fall into poverty, the middle class, this UDP government is forcing a lot of them into poverty because of their high taxes especially on fuel. It is time for the Prime Minister to honor the promise he made in 2009. It is time to keep your promises, sir and bring down the cost of living no matter what. In fact, Mr. Prime Minister, if you want to give the Belizean people a good Christmas Cheer then bring down the cost of diesel now. Thank you, madam speaker." "The fact is that we all know that the biggest driver of price increases to the consumer is what happens on the world market- the acquisition cost of fuel which we have to import. And when the leader of the opposition says what the acquisition cost is currently, he doesn't say what it was a month ago or a couple of months ago. When there are increases, when there have been increases over the past year it is in consequence of the increase in acquisition cost. I would expect that with the next shipment there is very likely to be a decrease. It fluctuates, it goes up and down. And if you are a believer in the omnipotence of the good president of the United States of America, we can look forward to a period of lower oil prices." "Madam Speaker just yesterday, when we nationalize BEL and premise behind that was we were going to lower down the cost of electricity. Just this year in May they got an increase and here comes 6 months later BEL is already announcing that they are going to ask for another price increase, that the average consumer will be paying 41 cents and a half per kilowatt hour." "You said that we acquire BEL with a view to trying to lower cost for the consumer. That is true, but that wasn't the immediate reason for the acquisition. 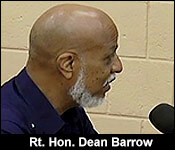 You forget that there was at that time a certain gentleman who was the honcho for Fortis, one Mr. Stan Marshall who has said to us that if we did not, without any reference to the public utilities commission to this country, immediately agree to an increase in BEL's charges at the time. Remember they owned BEL - that he would plunged this country into rolling blackouts. That was what caused us to say it ain't going to happen and that is why we moved. In terms of what they are talking about wanting an increase. Well, you know that it's complicated. There are all sorts of pass through formulas ingredients that must be taken into account, but the bottom line is that BEL can say anything it likes. BEL can ask for anything it wants, it is the Public Utilities Commission that will ultimately determine whether any increase can be granted."